The Veterinary Teaching Hospital (VTH) serves as the extension arm of the College, providing veterinary services to the surrounding community and laboratory for training junior and senior clinicians. It has facilities for diagnosis and treatment of various diseases and disorders of farm, companion, laboratory, wild and exotic animals. It now has two stations, the Los Baños Station in Maahas and the Diliman Station in Quezon City. 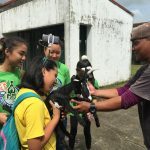 VTH collaborates with various organizations and institutions in conducting activities that promote the care, health and wellness of animals as well as responsible pet ownership and tours for students who are considering Veterinary Medicine as a career. 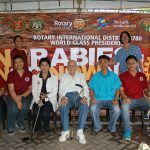 To provide expert assistance towards the eradication of Rabies by the Year 2020, the Department of Veterinary Clinical Sciences (DVCS), the Veterinary Teaching Hospital (VTH), and the Extension Coordination Committee of the College Veterinary Medicine (CVM) conduct annual anti-rabies vaccination drives. The CVM Faculty and students, in collaboration with CVM alumni, local government units and private organizations and institutions, vigorously involve themselves in this meaningful activity. 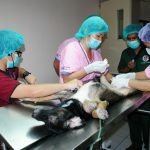 The Department of Veterinary Clinical Sciences (DVCS), Veterinary Teaching Hospital (VTH), and the College of Veterinary Medicine (CVM) hold spay and neuter programs throughout the year. This service, usually conducted in both the Los Baños, Laguna and Diliman, Quezon City Stations, caters to the residents of UP Los Baños, UP Diliman as well as their neighboring communities. The program enables the College to aid in the control of the animal population, especially stray dogs and cats. The CVM Faculty, students, and alumni actively participate in this worthwhile endeavor. 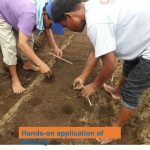 The Extension Program of UPLBCAFS-LGRTS is a Public Service endeavor composed of Training, Technology Demonstration, Technical Advisory and Products Distribution of seedlings, seeds and planting materials to clients. There are both seasonal and on demand program for training. Seasonal training is in collaborative with the La Granja Agricultural Research and Development Center, a consortium wherein we are the Training coordinator. This caters to graduating Agriculture students all over the country.